Disclosure: This post is sponsored by TransOcean. I received a free sample of the product and compensation for the purpose of this article. All opinions are my own. 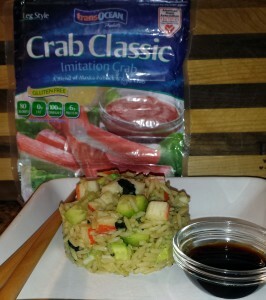 When TransOcean asked me to create a recipe for Crab Classic, I settled down with an easy dinner bowl for myself, so I could taste the flavors and ponder my future creation. That night, I was feeling a little lazy, and I didn’t feel like going out to shop for myself for dinner ingredients, so I made a simple, deconstructed dish, as I often do. Well…I soon realized that the California roll bowl I’d made out of convenience was actually a fabulous dish that was exactly the recipe I was looking for. It’s fast, it’s easy, and it’s delicious. Could you possibly want more? Sushi, especially the California roll, almost always relies on surimi when it comes to crab. 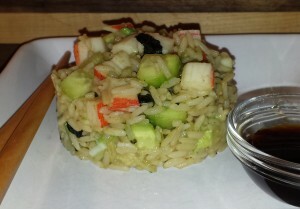 For this recipe, I used TransOcean’s Crab Classic which is actually made from wild Alaskan Pollock and King Crab meat. It’s gluten-free (made in a 100% gluten-free facility), fat-free, and certified by the American Heart Association as heart healthy. AND it’s sustainably-sourced. 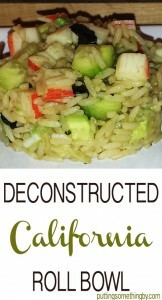 This deconstructed California roll bowl is a great recipe to make when you have some rice leftovers, and it’s easily modified for varying diets. If you want to drop a bit of fat, cut back on the avocado. 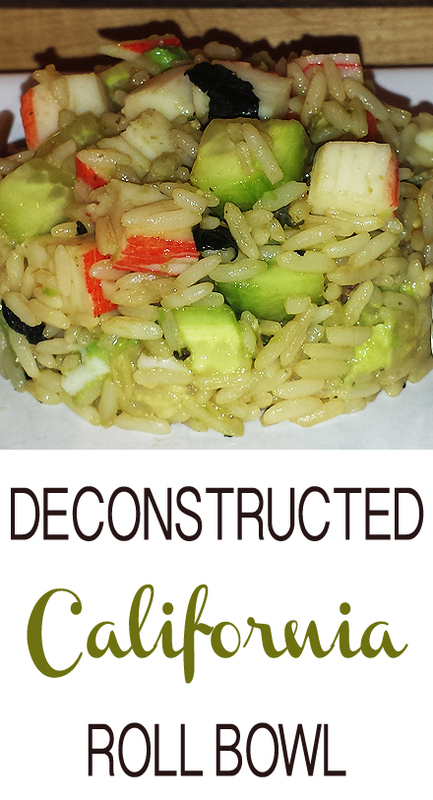 If you want to get creative, use brown rice or a medley. Start with cooked rice. I happened to have a frozen rice medley that has brown rice, red rice, and black barley on-hand, so I just microwaved that for three minutes and I was good to go. My second time around, I used parboiled rice, and it was awesome. You don’t need any specific kind of rice for this California roll bowl – since you don’t care if it holds its shape, just use what you have. You can eat this dish at room temperature like you would a California roll, but the husbster and I found that we liked this bowl a little on the warm side, so I personally just skip the “let cool” step for our taste. What’s nice about this recipe, though, is you don’t have to rush around worrying about dinner getting cold. If it’s cold, it’s still yummy. Keep your avocado green! Use the half of your avocado that came apart without the seed. Coat the avocado that’s left with a light coating of olive oil and cover it with plastic wrap to keep it from browning until you make this again. You don’t need nori for this California roll – just get the cheap seasoned seaweed snack. Mine came from an Asian grocery’s snack aisle. If you want to make this recipe for more than two people, double or triple the recipe. It’s that simple. Use parboiled rice instead of sushi rice. Unless you’re a sushi connoisseur, you really won’t notice the difference. Use a quarter of an avocado instead of half. The second time I made this, I had just a quarter of an avocado left, and it was still mega-YUM. You can use regular-sized cucumbers, but I had the small Persian cucumbers on-hand and prefer their taste. This is one of the simplest recipes ever – it’s a matter of making the rice, chopping up easy ingredients, and mixing things together. It also works well if you do a little mise en place. Once your rice and vinegar/sugar mixture are ready, you can pretty much dump everything in and stir. 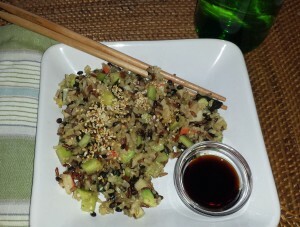 My first version of this California roll bowl was completely deconstructed and non-fancy, and I used a medley of brown rice, red rice, and black barley. Because this is how I really roll…with my bowl. Also, I understand that it’s not actually IN a bowl, but you get what I mean by “bowl,” right? As in, you can totally throw this in a bowl and eat it. In a skillet on the stove on medium-low heat, toast the sesame seeds. In another skillet on medium-low heat, heat the sugar and rice vinegar until the sugar is dissolved. Put the cooked rice in a bowl. Add the sugar-vinegar mixture and soy sauce to the bowl and toss to combine. 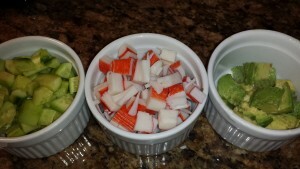 Add cucumbers, Crab Classic, and avocado to the bowl and stir to combine. Break up the seaweed sheets into pieces and stir in. Sprinkle toasted sesame seeds over the top. Serve with a little soy sauce and wasabi on the side. Greetings! Quite helpful guidance on this article! It is the small changes that make the biggest changes.